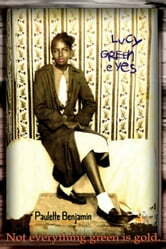 Lucy Green Eyes is a true story depicting actual events in the life of a young girl, Merlene McDaniel, who was given away to be raised by her grandmother. As Merlene grows, she has to learn to deal with the stains of her illegitimacy, abandonment, and molestation, all while maintaining a lying grin to uphold her brave facade. A captivating and soul-tugging account of the emotional and physical endurance possessed by an innocent child.